In our 2017 Sustainability Report, we show how our commitment to our people is at the forefront of everything we do. From recruitment to onboarding to succession planning, we are dedicated to growing the careers of everyone we hire. 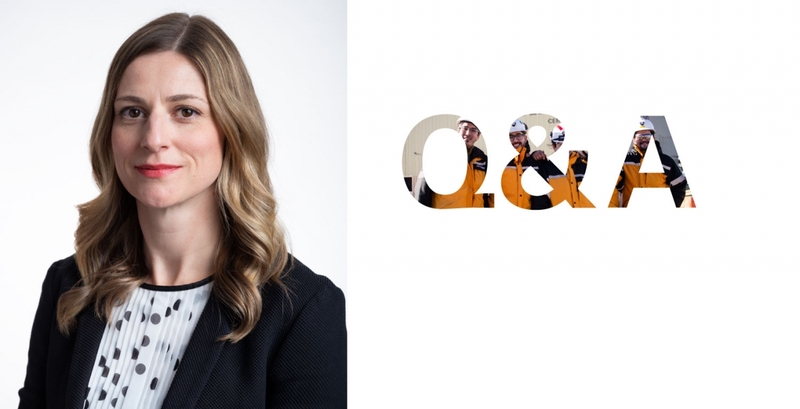 We sat down with Jenine Ellefson, our Vice President, People to talk about the many changes, successes and challenges we encountered in 2017, and how these stories have generated fruitful learning experiences and lasting value for the company. Looking back on 2017, what were some of the main accomplishments and highlights that come to mind for the People function? In 2017 we concentrated on talent management and people development. We were proud to implement our redesigned StepUP program and new Future Leaders program, both of which focus on developing and supporting our people to achieve their potential. StepUP is a training program we developed to provide our employees with the tools and behaviours designed to achieve results in a safe, productive and responsible way. Future Leaders is a one-year development program designed to prepare participants to take on progressively more challenging leadership roles. The People function also completed a major milestone in our Human Resource (HR) systems journey whereby all sites globally are now using our CORE Human Resources Information System (HRIS) to manage employee data. This will allow us to leverage future opportunities to deliver HR services and tools across the company in a more innovative and effective way. What were some of the challenges? What did the company learn from them? In 2017, we continued to transition to a new decentralized operating model, which was introduced by our CEO in 2016. This change required some role adjustments and created a period of uncertainty as people transitioned into this new way of working. As a result, the corporate People team has been working on redefining its role to be focused on setting standards and guidelines, while still supporting sites to implement new programs and policies. We also saw several senior leadership changes in 2017, including the appointment of a new COO and new CFO. Under the direction of the new senior leadership team, Goldcorp’s culture is evolving and we have adopted a new set of values (Being Safe, Productive and Responsible). There is no doubt that cultural change takes time and the People team has been concentrating on embedding the new values to create a strong foundation for our newly developing culture. What are some issues or trends you anticipate will affect Goldcorp in the coming years when it comes to Goldcorp’s workforce recruitment, retention and development? Two trends I already see starting to affect us are the existence of a multi-generational workforce, and the impact of technology and innovation on the mining industry. We need to ensure we continue to provide diverse programs that attract, motivate and retain all employees. In terms of technology, I am mindful that as we introduce new technology and innovation into our workplace, we need to be aware of how we prepare our workforce and surrounding communities to adapt to changes in the workplace. Goldcorp conducted an Engagement Survey in mid-2017 that was sent out to all employees in the company. What were some of the key findings? What actions is Goldcorp taking to address the opportunities identified? Yes, we did conduct an Employee Opinion Survey! This was one of the highlights for the People team in 2017. We were pleased to see that employees feel that Goldcorp is a safe place to work and they have the tools and resources to do their job effectively. Some of the key opportunities for improvement identified by the survey were: 1) the desire for better collaboration across different functions and departments; 2) a better understanding of career development opportunities at Goldcorp; 3) better alignment of priorities from senior management and 4) more frequent and transparent communication from leadership. Following receipt of these findings, each site has been tasked with implementing tailored action plans for their location. We have been really pleased with the high level of engagement from sites and employees throughout this process, and are focused on ensuring this is a ground-up initiative where employees can truly have an impact on their day-to-day experience at Goldcorp. Looking back over the past five years how would you describe the journey Goldcorp has been on from a People perspective? Over the past five years, the People department has supported the business through a lot of change. We have helped the business and our employees deal with uncertainty and ambiguity as the business has grown and matured. I am pleased to say that we have evolved from an organization that bought talent to one that is building talent. We are now in a position where we have installed and implemented systems and processes to support future growth. Throughout this journey we have aimed to remain flexible to be able to support the business in each stage of this evolution. What is Goldcorp doing from a People perspective that will change the way that human resources is approached, conducted and perceived in the future? Our goal is to create a sense of purpose and meaningful connection for all our employees. We are being deliberate about the types of new programs and practices that are introduced and the impact these will have on employee engagement and experience. We want our people to feel that working at Goldcorp is more than just a job, but instead is a place to have a career and create sustainable value. Our People team under Jenine’s leadership has undergone many changes in 2017. The departmental successes emphasize that listening to employees, adapting to change and creating a positive culture creates sustainable value for everyone at Goldcorp. To read Jenine’s full Q&A please visit the Our People section of our 2017 Sustainability Report.